These are not your ordinary flies. These are premium flies tied to the proper proportions and with the best hooks and materials on the planet! The Industry leader in contemporary innovative fly designs tied to the highest standards in the world! Tying the highest quality cutting-edge fly patterns for 43 years! Every once in a while we discontinue a pattern, tie more than is needed, or tie a pattern not to specification. 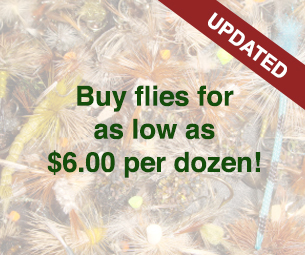 As a result we have many flies we are just dying to get rid of and would love to sell them to YOU at irresistible prices!